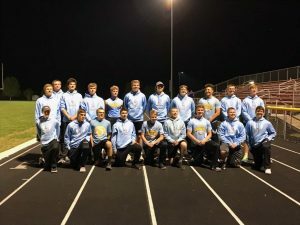 The Lynnville-Sully track and field boys had a truly stand-out night at the district meet last Thursday, qualifying eight athletes for state in seven different events. All but one of the qualifiers have competed at state at least once before. Coach Mike Parkinson was thrilled with multiple achievements of the Hawks at BGM on Thursday. Senior Corey McCoy picks up speed as he prepares to accept the baton from junior Nate Stock in the sprint medley. L-S made it to state in this event as an at-large qualifier. 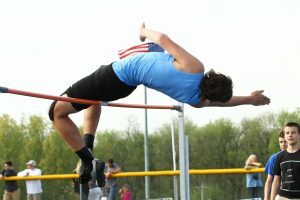 Junior Tyson Vander Linden and senior Corey McCoy qualified for state in the same four events, which is the maximum number they could qualify in. They will be competing against each other in the open 400-m hurdles after going one-and-two at the district meet. Vander Linden won the race in 55.68 seconds, and McCoy took second in 56.04 seconds. Vander Linden and McCoy will be on the same relay team with senior Sage Zylstra and junior Nate Stock in the sprint medley, which qualified with a time of 1:35.87 in second place. Vander Linden and McCoy will also compete in the shuttle hurdle relay with senior Carson Dunsbergen and junior Gage Vander Leest. They won their event at the district meet with a time of 1:00.21. 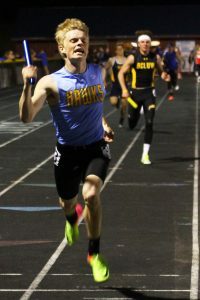 Those same four boys will also be running in the 4x400 at state after earning first at districts with a time of 3:32.01. Vander Leest also qualified for state in the 110-m high hurdles with a time of 15.38, which earned him second in the district. “It was really awesome to see everyone compete to the best of their abilities and see all of our hard work pay off. I couldn’t be any happier with the way we performed,” said Vander Leest. Two Hawks will be competing at state in the field events. Junior Rylan James qualified for the second year in a row in the shot put with a throw of 48’04”. He placed second at Thursday’s meet, but threw far enough to qualify at large. Senior Drake Ehresman placed first in the high jump, qualifying for state for the first time with a jump of 5’10”. Senior Drake Ehresman clears the bar at 5'10" on his way to winning the high jump at the district meet and qualifying for state. As a team, L-S finished in second in the district with 101 points, just four points shy of first-place Belle Plaine. Other teams in attendance were Baxter, BCLUW, BGM, Collins-Maxwell, Colo-Nesco, GMG, HLV, Iowa Valley, Meskwaki, Montezuma, North Mahaska, and North Tama. Other L-S events to place at the district meet included Ehresman placing second in long jump with a jump of 19’, and sophomore Kinnick McFarland jumping 17’06” for seventh place. In the discus, James threw 116’6” for seventh place, and senior Jesse Van Wyk threw 117’08” for sixth. Junior Tyson Vander Linden crosses the finish line in first place in the 4x400, wrapping up a very successful district meet for the Hawks with eight state qualifiers. Zylstra placed sixth in the 100-m dash with a time of 11.85. 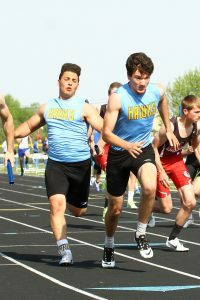 He also earned sixth in the 4x100 with sophomore Ethan Wyma, Vander Leest, and Stock with a time of 46.17. The distance medley placed seventh in 4:10.95 and was run by Stock, McFarland, junior Ty Breeden, and senior Cody Gibbs. Best of luck to the eight state qualifiers as they compete at the 2018 Iowa State Track and Field Championship at Drake Stadium in Des Moines this Thursday, Friday, and Saturday. Members of the L-S boys track and field team that placed second at the district meet are, from left, front: Carter Dunsbergen, Carson Dunsbergen, Blake Rea, Ethan Wyma, Hannes Van der Meer, Ty Breeden, Gage Vander Leest, Evan Squires, Sage Zylstra; back: Payton Van Wyk, Rylan James, Corey McCoy, Cody Gibbs, Tyson Vander Linden, Jesse Van Wyk, Drake Ehresman, Grant Wehrle, Nate Stock, Kinnick McFarland, and Kemper Lukehart.